NYC Adventures With Microsoft Office 365 Home Premium : The Video! 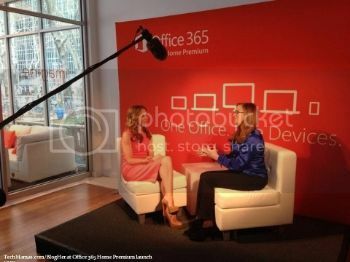 At the recent launch of Office 365 Home Premium in New York City’s Bryant Park, I had the opportunity to experience the new features of Office while talking to some very exciting people (keep reading to find out who!). The Microsoft Office 365 experience center showcased the services and applications (for example Word, Excel, PowerPoint and check out OneNote) that together comprise the new Office and demonstrated how they work together for a great experience that helps you amaze, share, connect, explore, create and imagine. These days, I’m constantly amazed at when and where I can actually get things done. The new Office provides me with instant access to my documents and information offline or online, enabling me to be more productive by utilizing brief segments of my day to get things done for my family and myself. The option to use Office 365 on five devices (including PCs, Macs and Windows tablets), stream full Office apps to any Windows 7 or 8 PC, and use Office Web Apps on mobile devices also gives me the flexibility work how I want. After all, being more efficient during the day simplifies my life, and makes my nights less hectic. Check out my new video on BlogHerTV that not only shares a VIP tour of the launch but also showcases interviews with interesting people. See what busy mom and Hollywood actress Felicity Huffman says came to her rescue managing her life as a mom. Hear what my blogger buddy Jen Singer from MommaSaid.net can do from a waiting room at the Vet and learn tips from Office Insiders regarding how they are using the new Office to make their life easier. Of course, considering where I was (Bryant Park on a beautiful winter day), I had to put on some ice skates for a New York City winter adventure. Luckily, Jen Singer decided to join in the fun!